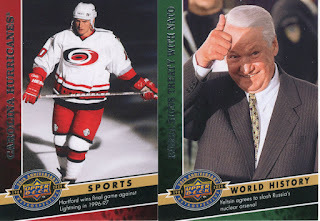 blasters of 2009 O-Pee-Chee. (Do I have a secret stash?? You'll never know...) Though I love them so very much, I just can't continue doing it mostly because I ran out of coupons and don't want to spend $20. At $13 bucks it's really hard to resist, but $20 doesn't sound quite as tempting. I'm currently sitting at 472/600 and waiting on cards from gcrl, Sooz, and I think Stale Gum which leaves me in decent shape to finish the set at the show in August or by trades soon. 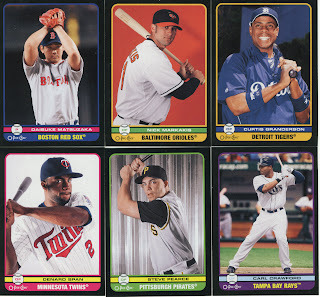 This last blaster had a little bit of everything that you get in a hobby box more or less, and only cost $13. I haven't had a chance to log the black parallels yet but I do believe I have over 100 (I'm telling you I have issues), and some doubles that I am hoping to trade for some black parallels that I don't already have. I'd like to complete the black set also, but not really on my high priority list of cards at this point. Of course they are Red Sox. I really like this subset, just haven't encountered a Yankee yet. I absolutely love him back in the Seattle uniform. Not sure why but I feel like he looks like himself, and it kind of adds to the retro feel of the card. Holy moly!! Two pieces of gu jersey that have stripes? Must book for at least $50 (haha), however since I don't care for any of these guys I'm willing to trade it. I will be posting a list of my doubles from this set so we can trade for the cards we all need to complete this for those of you out there that are doing the same. 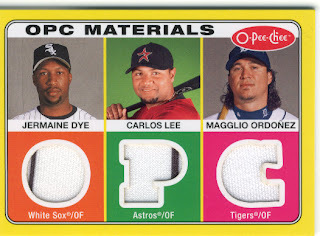 I have also (for the most part) updated my want list of OPC and others. 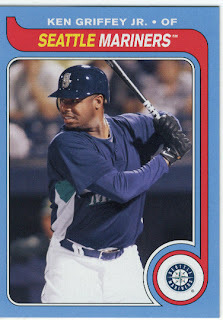 Wow, that Griffey Jr. card looks amazing. I will buy something different from now on. Promise. I have a few of the coupons from target for $2 off, let me know if you want them and I will send them your way. 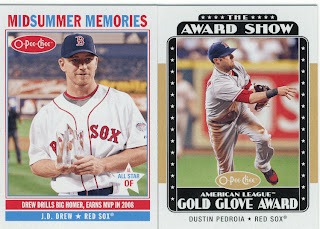 I have no use for them now that I am Ginter hooked, and you'd be better off trying to complete the set. LOL, if you send them please don't ask me to post a break. I promised Mario I would stop. No need to post the breaks, I just know I will end up tossing them in the trash and would rather a collector use them. Drop me a line on my blog and I will drop them in the mail on Monday for you. Least I could do for a fellow Yanks fan! Have you been using multiple coupons again? Has that always worked for you? 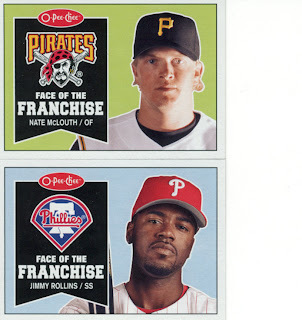 The Yankee Face of the Franchise card is someone you would want, not that you wouldn't have guessed it already. It took me 7 hobby boxes to find him. Good luck.